She first sang with her dad, in weddings as well as church, at the age 10. After finding fulfillment in her private studies in piano and voice, she went on to study music and music therapy at Edgewood College and UW Eau Claire respectively. She is a passionate, soulful voice that cares for people with deep, abiding sincerity. 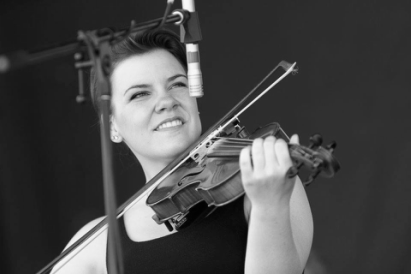 In addition to singing lead in The Krause Family Band, she has been a regular guest of Madison-based bluegrass band, The Oak Street Ramblers. Ruthie followed in her big sister's footsteps, learning the 'songs,' and began violin in grade school orchestra, but soon began picking up the old timey tunes and styles she heard around the house. She was blest to find a teacher in the wonderful Chris Wagoner, who taught and encouraged her in her efforts. 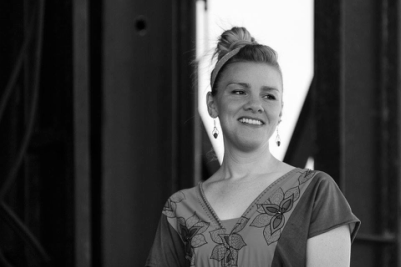 Ruth's ear for harmonies and grooves, along with tune/song writing skills are essential. She and sister Kate love singing in the old "brother-duet" style, (think Everly's, Louvin's, Monroe's, Delmore's...), but also can tear it up on Frank and Nancy Sinatra's version of "Something Stupid!" When she's not playing with the family, Ruthie and her husband, Blaine are the singing and twin fiddling duo of traditional western swing band, The Radio Wranglers and traditional Irish and Celtic group, ​Bí Dána. She is also a frequent guest of Madison-based honky tonk band, The Dang-Its. Rick Is papa to the aforementioned (as well as little sis, Heidi Marilyn), and is married to the girls' wonderful mama, Karin, (his 'brown-eyed flower'). Rick's been at music, in some manner or another most all his life, (first band at age 7....possibly, the first all air or paper guitar Beatles cover band in 1965. Definitely, the pride of Lenexa Central Elementary School). That same group aquired real guitars and such, a few years later, to form the garage/basement band, 'Ubiquitous' or sometimes known as 'You Pick With Us." He listened to everything from Bing Crosby to DeFord Bailey and Arthel 'Doc' Watson. Music has always been a family matter for Rick, who's mother was a wonderful pianist and singer of the American Songbook, from Gershwin to Bachrach/David. Mel Torme was played a lot around the house. 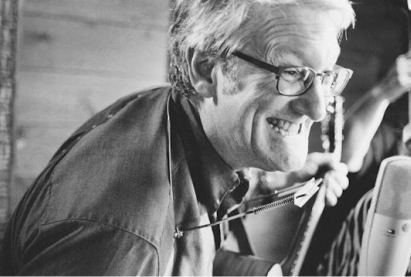 His granddad was an old timey, Southern Missouri fiddle player, and passed on the love of roots music to the KFB. Rick is also a frequent featured guest of Madison blues greats, The Bill Roberts Combo. Pianist and vocalist, Scott Wright, has been described as the band's "live music box", as his tasteful and tender playing compliments everyone he plays with, whether it's accompanying a vocalist for an event, leading worship at Destiny of Madison, session/studio work for recording projects, or backing up the Krause Family Band. He has also lent some of his beautiful arrangements to the band and teaches private piano lessons. If you are interested in learning from Scott, let us know through our "contact us" page! His patience and thoughtful musicianship compliment any musical situation he finds himself in.